World bandy clubs’ fair called World Cup finished this Sunday in Sandviken, Sweden by triumphant victory of Enisej from Krasnojarsk. The russian champion has become the world’s strongest again 4 years later. For those who saw the final match the victory of Enisej in this tournament might seem as easy and careless as painfully helpless and doomed looked Sandvikens AIK in this fight — 0:5 (0:1). But the whole road to the final game for siberian club was not so easy. Enisej has successfully coped with its mission eliminating all those who spiked their wheels by overcoming its own mistakes and temporary breakdowns in the games pace. Russians showed steady pursuit to their cherished goal to win World Cup. Although Sandviken has reached the final too but is still a half step behind the russian hegemon. However there is an objective explanation of this: SAIK has no such the squad depth as Enisej. Taking into accound the fact that both teams possess the world’s best bandy schools and each is playing bandy they traditionally cultivate with varying degree of success during few last decades, however professional attitude of Enisej is much higher. This is obvious because bandy in Russia is completely professional. There is perhaps only Västerås SK among swedish clubs who can hold the same class as Enisej. It’s a pity that mesta mästarna failed to reach the final where they could have to set down priorities in a direct match — champion vs. champion — but World Cup is so interesting in its fulminant pace that either no one can allow any mistake or to immediately eliminate it. SAIK did not forgive VSK their errors in the semifinal and won this match 2:1 (0:1) for work but the price was too high. SAIK spilled all their stock of strengths and emotions out. Another one russian club SKA-Neftjanik was in Sandviken the most wanted team. An interest to them has been warmed up by their significant transfers the team’s management had selected in a pre-season. Everyone has been curious to see and estimate potential of a new super club, but the Far-easterns fairly disappointed respectable audience as their stated ambitions have not clearly gone along with the quality of their game. Having superstars in a squad does not mean that the team will take right off the bat and it’s still quite far away to that to obtain playmake stability. One should to highlight Brobergs IF and Edsbyns IF out of the group of other quarterfinal teams. The first one, if they have had more goodluck in a serie of aftergame 12-meter shoots in their ¼ final against SAIK, they would achieve ever best result in their recent history while the second one swarmed stoically up on the tournament’s grid despite the squad problems befallen down on them early in this season. Their old fashion and low-speed rustic but classical game concept has proved its right to life as long as they assert and commit their own way of playing bandy. If it brings result so they can be proud of it anyway. Two other remaining quarterfinalists Dinamo-Moskva and Hammarby IF were certainly dissatisfied with their results but the game shown by them has been spectacular and full-speed so both clubs have earned quite high appraisal from the part of world bandy community. That means they are still high in the sky on elite orbite and in the modern trend. Bollnäs GIF and Villa Lidköping BK are among those who have been squezeed out of quarterfinals by Broberg and Edsbyn. Both Bollnäs and Villa could have earned more respectful attitude towards their performance of no only fortune alone but also from the part of the organizers while setting up tournament’s grid. With high grade of respect to the finnish Kampparit and norwegian Ready who dared to challenge the world bandy elite, they are still whipping boys who made a wrong choice of a tournament. They should be in neighboring Rättvik at this time where alike bandy cup of B-class hosted, which by the way, did not muster a quorum as well as World Cup in Sandviken. 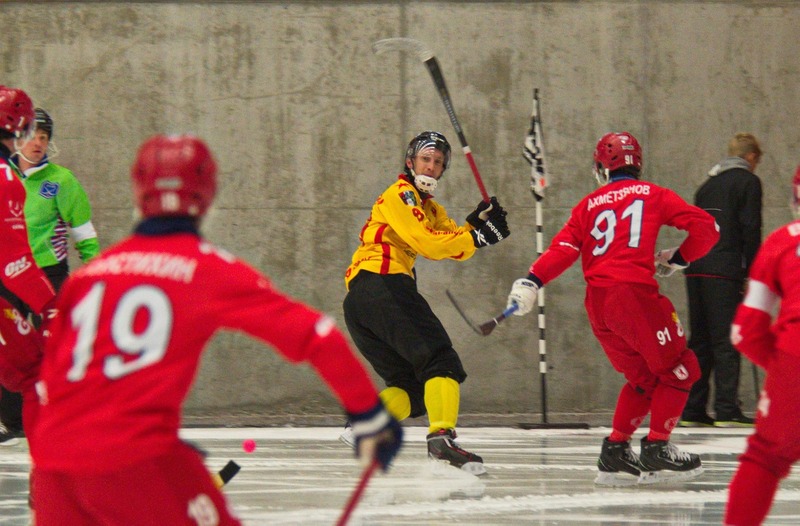 As a result, although XXXXII issue of World Cup did not get classically harmonious and equal structure for all participants but still turned into traditional bandy tournament represented all the modern and best that is available. World Cup has become a sort of world bandy club’s fair where victory is always given by prise of efforts and excitement beyond all the limits. It’s never happens to come to to the cup and to take it by chance. World Cup shatters illusions and punishes cruelly any even the slightest error. What is higher than courage to declare ones right to be called the best club in the world, to come to Sandviken and to win? Only the award which is the Cup of the world that Enisej conquered.